East Down Parish has nearly 20 kilometers of public footpaths. Click on the map for a downloadable map of the Parish (A1 size) including footpaths and footpath numbers. Unfortunately, the resolution isn’t great - not as clear as a standard OS map. 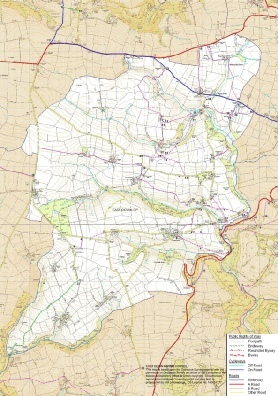 Therefore we recommend that this map is used in conjunction with the correct OS map of the area. We have three walks available in leaflet form - you can click on the links to download these printable leaflets. All three walks start at the Village Hall. The maps are indicative only and we recommend that an OS map of the area is carried.